Rep. Aaron D. Kaufer, (R) serving District 120 a part of Luzerne County, recently introduced HB 531 – Community Solar Legislation. Kaufer is the prime sponsor of this bi-partisan legislation that is co-sponsored by Rep. Donna Bullock, Rep. Peter Schweyer and Rep. David R. Millard. This Community Solar Legislation will enable community solar projects in Pennsylvania and continue the effort legislators began last year in collaboration with solar businesses and other organizations. Community solar creates exciting new markets and encourages entrepreneurship by dramatically expanding opportunities for neighbors, businesses, farms and other community members to participate and benefit from a solar project connected to the electric grid in Pennsylvania. In community solar, participants can subscribe to a portion of an offsite solar project and receive credit on their electricity bill for the power produced, just as if the panels were on their roof. Community solar gives citizens and businesses the choice to participate—there is no mandate for participation or request for state funding. By passing this legislation, Pennsylvania would join 18 other states in giving its residents and businesses the opportunity to acquire solar energy from a community solar project. Many Pennsylvanians currently lack the ability to directly participate in Pennsylvania’s growing solar economy. They may be renters, live in an apartment building, have a shaded or otherwise inappropriate roof for solar. Others may own their properties, but may be uncertain in their length of tenure or the willingness to finance a traditional solar installation that stays with the property. This bill removes an existing policy and market barrier, allowing for much greater participation in the solar economy by individuals, business and farmers if they choose. LAMPa, along with partners, sponsored a Community Solar webinar last fall. 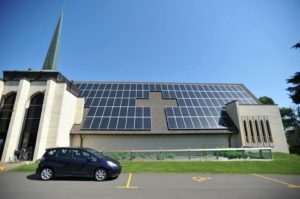 Affordable community solar energy provides families, churches, schools and many others with a way to lower energy bills while serving the common good and being good stewards of the earth. LAMPa will continue to follow this bill and provide updates.